alaTest has collected and analyzed 91 reviews of Vizio M80-C3. The average rating for this product is 4.2/5, compared to an average rating of 4.6/5 for other products in the same category for all reviews. People really like the size and design. The usability and price also get good feedback. Reviews are divided on the durability. We analyzed user and expert ratings, product age and more factors. 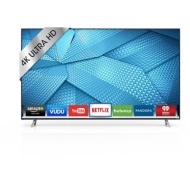 Compared to other products in the same category the Vizio M80-C3 is awarded an overall alaScore™ of 91/100 = Excellent quality. Great price and an excellent picture. Love the size (70 Inch) and the picture quality. We haven't found anything that we don't like. "Good TV but flops on being a "smart TV""
Good TV but flops on being a "smart TV"
"Great Features. Great Price. Tier 2 (or below) Build Quality." Glaring manufacturing defect. Mediocre design quality that is "functional" at best. Great Features. Great Price. Tier 2 (or below) Build Quality. I use CNET extremely actively (and often) to make buy decisions on consumer electronics and audio/visual equipment.